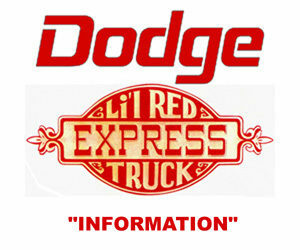 Above: Dodge and Lil Red Express Truck logos from factory brochure. Announcing the exclusive new Li’l RED TRUCK …the factory-customized pickup from Dodge. Meet the new LI’L RED TRUCK from Dodge, the truly “customized” that’ll stir excitement among even the most avid “trick-truck” enthusiasts. Best of all, it comes fully equipped from the factory. No need to seek out expensive local customizers and special-equipment suppliers. Its delivered to you ready-to-roll. The LI’L RED TRUCK is an adult toy for the young at heart.. for anyone who who drives for the pure pleasure of it. This D150 Adventurer model, with a Utiline body style, is built on a 115″ wheelbase. The Exterior is Bright Canyon Red. Inside, red or black interior trim. There are gold accent tape stripes on the wheel openings. Raised white outline letter radial tires with steel chrome five-slot disc wheels. Special dual exhaust system with chrome-plated vertical tailpipes and heat shields are mounted behind the cab. And speaking of chrome, you’ll find it everywhere… chrome-plated valve covers, air-cleaner cover, side steps. Even the bolt heads that attach the applied oak panels to cargo-box sides and tailgate. There’s a gold eye-catching Li’l RED EXPRESS TRUCK decal on the side doors and a gold Li’l RED TRUCK decal on the tailgate as well. Other features include a 360 v-8 engine with four-barrel carburetor, automatic transmission, power steering, Convenience Package, oil-pressure gauge, bright rear bumper and “tuff” steering wheel too! The new DODGE Li’l RED TRUCK will turn a lot of heads… a limited-edition pickup with chrome-plated good looks. Only Dodge has it. So live a li’l… A Li’l RED TRUCK, that is!